Alan Dunbar at Baltray last month. 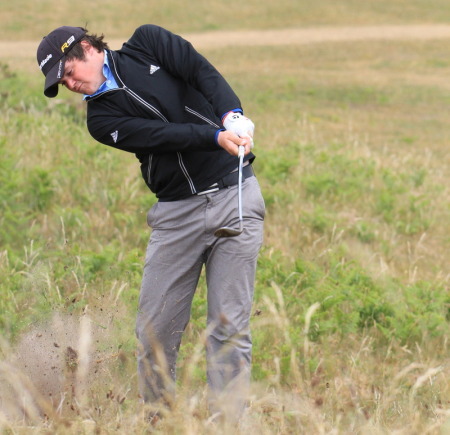 Credit: Jenny Matthews www.golffile.ieRathmore’s Alan Dunbar bounced back from some recent indifferent performances to lie just two shots off the lead after the opening round of the Brabazon Trophy in brutal conditions Burnham and Barrow. Bidding for a place in September’s Walker Cup side to face the USA at Royal Aberdeen, the 21-year old Ulsterman opened with a one-over par 72 to finish the opening day alone in second place behind Corhampton’s Neil Raymond with Mourne’s Reeve Whitson a shot further back in joint third. It was a day to forget, however, for West of Ireland and Irish Close champion Paul Cutler who shot an eight-over 79. Battling west winds gusting over 30 mph, Dunbar was level par through six holes before turning in 37 then came home in 35, picking up three shots in the last three holes including an eagle-two at the last. Whitson shot a 73 to share third place with Joe Vickery and Australian Matthew Stieger on an otherwise frustrating day for the Irish contenders. The first hole at Burnham and Berrow.Hampshire native Raymond, who was the only player to break par, was delighted with his performance. While Castlerock’s Aaron Kearney is tied for 34th after a seven-over 78, Portstewart’s Paul Cutler, Co Sligo’s Michael Durcan, Carlow’s John Greene and recently crowned East of Ireland champion Richard O’Donovan from Lucan all shot 79s. They are just inside the top 60 and ties who will make the halfway cut but Jeff Hopkins (82), Kelan McDonagh (85) and Barry Anderson (89) need something special on Friday to progress. Royal Dublin's Niall Kearney was inspired by Shane Lowry's Irish Open triumph as he romped to a five-shot win in the Brabazon Trophy at Moortown near Leeds. Alan Dunbar is finding form at the right time. Credit: Jenny Matthews/www.golffile.ieHe might have finished boigey-bogey but Alan Dunbar gave his Walker Cup chances another huge boost when he fired six birdies in a three under 68 to keep leader Neil Raymond in his sights at the halfway stage of the Brabazon Trophy. The talented Rathmore man is Raymond’s (68) nearest challenger, just two strokes adrift on two-under par at Burnham and Berrow in Somerset (Scores). Watch out too for Mourne’s Reeve Whitson, whose one-over 72 left him tied for third with Peterhead’s Philip McLean and just seven shots behind. 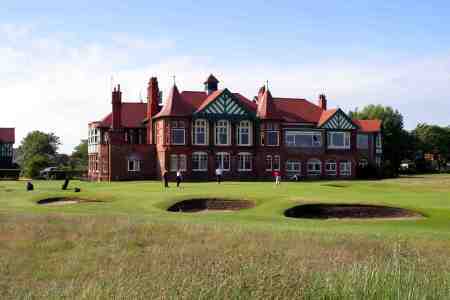 Alan Dunbar lost a ball on the fourth in the third round of the Brabazon Trophy at Burnham and Berrow.Alan Dunbar crashed from second to fourth after a third round 79 as Neil Raymond opened up a five-shot lead heading into the final round of the Brabazon Trophy at Burnham and Berrow. 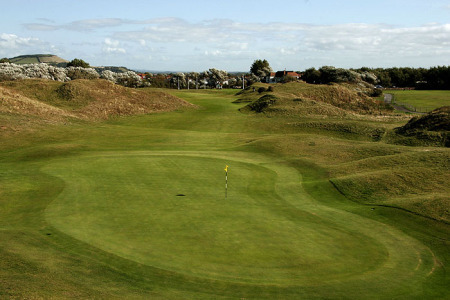 The 17th at Burnham and Berrow’s Championship course.Alan Dunbar boosted his strong Walker Cup hopes when he closed with a 69 to finish just a shot behind winner Neil Raymond in the Brabazon Trophy Burnham and Berrow.